Trincomalee is a beautiful town located on the east coast of Sri Lanka. Trinco offers one of the best beaches in Sri Lanka. This magnificently-beautiful town is surrounded by wildlife, rock formations and hill tops. Its landscapes are astonishingly beautiful, making it a paradise for visitors. 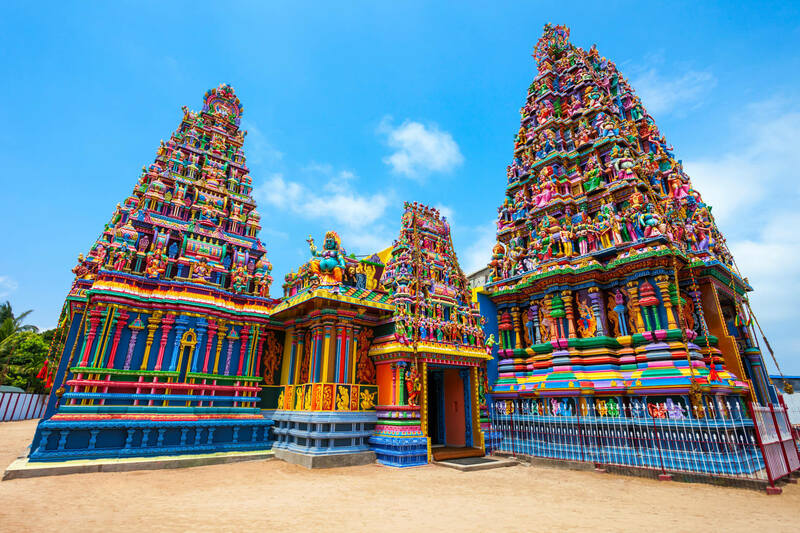 A Hindu temple dedicated to the Goddess Kali, Sri Pathrakali Amman Kovil is one of the most spectacular Hindu temples you will see in Sri Lanka. It’s a large complex of connected shrines located in the Trincomalee Konesar Malai area. The kovil is very impressive with its colourful look and plenty of stories visualized in the sculptures. Not only does the temple have such an amazing interior design, it is also a place with an interesting history. It’s a marvelous experience for visitors, watching devotees pray for their needs by breaking coconuts in front of the temple. At 11.30am they have prayers and even non-Hindus will feel very welcome. You will be blessed with dots on your forehead, a remarkable experience you will never forget. The most unique feature of the temple is that it is brightly painted inside and the outside, which is also very ornate. The unbelievable colorfulness of the temple is truly awe-inspiring. An amazing degree of detail will keep you snapping away. This is a place truly worth your visit. Sri Pathrakali Amman Kovil is located just over 2 hours from both Dambulla and Pasikuda. Choose to stay at one of our Dambulla Hotels or our hotel in Pasikuda and enjoy unrivaled comfort on your travels.